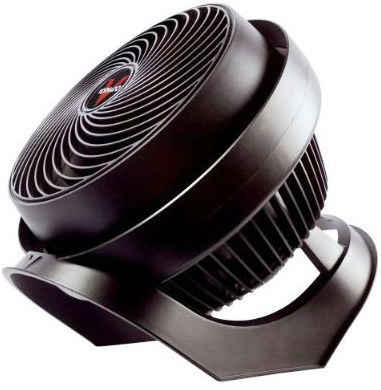 Pros: Powerful fan, attractive design, innovative features, fan wind bounces off walls, energy efficient. Can the stuffy feeling in a room. Fan has many purposes. Five year warranty. Built in stand has three angles that can arguably keep a steady breeze on you wherever you are in the room. Long power cord. Great customer service. Cons: Arguably a little loud, may not help all rooms (in terms of eliminating stuffiness.) The fan is slightly large. Price is a high for a non-industrial fan. I would like more adjustment options for the fan. 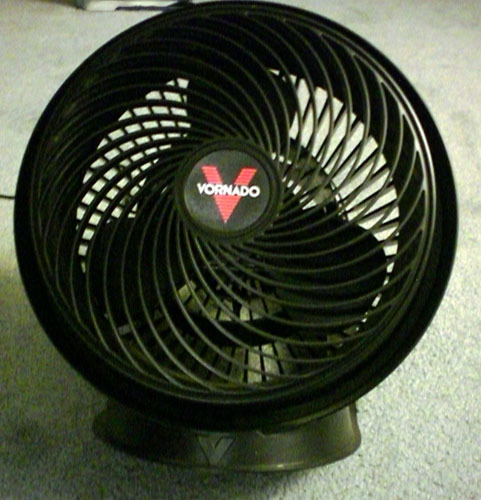 Key Takeaway: The Vornado 733B is one of the best fans I have seen to this date. The pros outweigh the cons. If you are unsure whether or not it will work for you room, get it at a place like Amazon.com where you can try it out and return it if the product is not up to your standards. 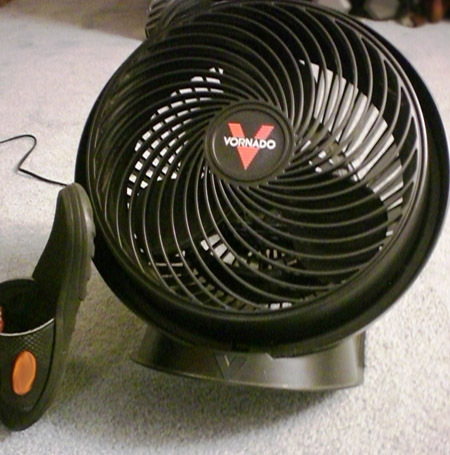 Vornado fans use some of the most innovative technologies out there. If you are going to live in an old dorm or an apartment with bad air conditioning, than the Vornado 733B is for you! Don’t need a fan this big? Click the links above to view the other models. Although others may not be as strong, the underlying technology is very similar. I in particular would recommend the 630, as it was the previous one I used till Vornado was kind enough to send me this one. Specifications: Vornado does a nice job at summarizing most of the import specifications for you. See my note below them though, as well as my miscellaneous section. Note: RPMs, Power Usage, and Air Moved will vary naturally and even more so upon speed setting. I made sure to personally take some photos of this for you all since you wanted more. The packaging here is very standard. There are just a few pieces of paper (warranty information) and cardboard to keep the fan in place. The fan’s power cable is tied with a black wire-tire and has a cap on the end of the power cable to protect the plug. 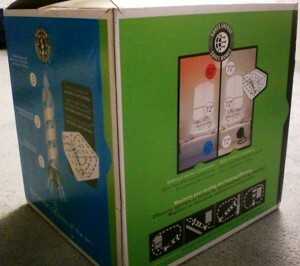 The packaging that the good folks at Vornado sent me had me a little worried, as it was packaging for another product. I did get the right product however. The packaging is informative and tells you about some of the benefits that the product has to offer. I usually keep design and technology separate, but in this case everything that you see is part of its technology, so they will be combined. 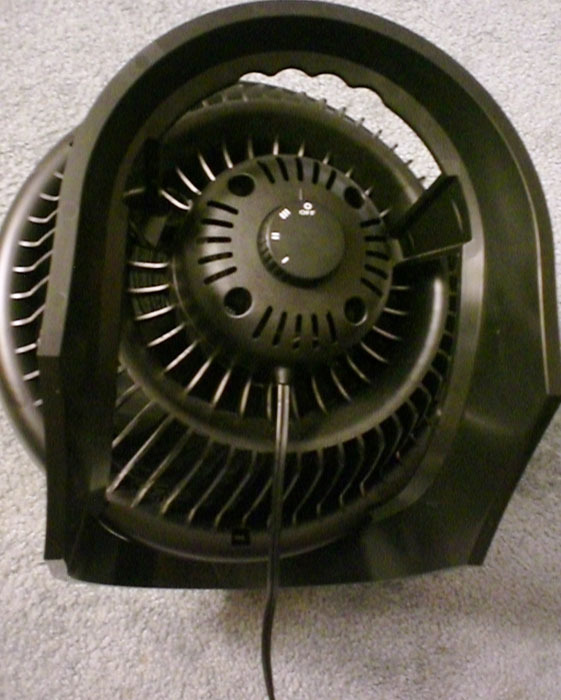 When you look at the Vornado, there are several different things that you are going to notice. This fan can be position three different ways. More likely than not, one of these three angles will be likely to hit you with the flow of air. This handle doubles as a stand, allows the fan to sit firmly in place. By sitting firmly in place the fan is able to get a smoother air intake. Now let’s get to the good stuff and look at the front of this fan! The first thing will be the grill in the front of the fan. As you can see, each strand of plastic comes from the center of the fan (where the logo is) and curves itself inward as it makes its way to the edges. This actually has a use. 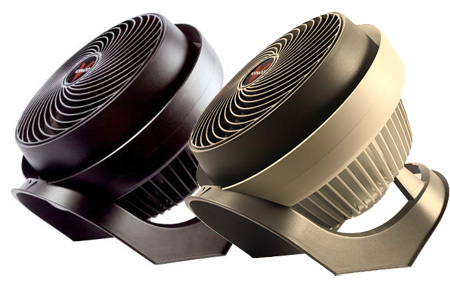 Vornado claims that this patented, unique grill design allows the air to circulate in a whirl-like motion. By offsetting the air like this, the Vornado fans are able to achieve extreme distances. Just beyond the grill, you will see the blades. There are three blades, each with a wide curved design. These blades have been optimized to push as much air as possible. The duct is the additional shaft that surrounds the bladed area along the interior circumference of the fan. It helps make sure that none of the harnessed air energy is dispersed elsewhere, making the air push out stronger. The accelerator increases pressure while reducing drag on the fan blades. This allows the fan blades to spin faster, while pushing more air. You may watch Vornado’s video explaining their technology. It is a short video (only a few minutes) and will do a better job at describing it than I will. One of the above photos are even from this video. For starters, the three position handle took a little while to grow on me. The previous Vornado I had could do many angles. I however soon realized that these three angles are almost all encompassing because the fan is larger and uses their most powerful fan motor (to this date and according to their website) that they offer. As for the other technology, they all have legitimate uses that produce effective results. This fan does shoot far (even on the low setting) and it can bounce the air off walls. Remember that these features will be a little over glorified, and are fan in other fans as well. However, I believe that Vornado does a wonderful job at putting it all together. Note: This photo is provided by Vornado on their website. I know what you are all thinking… you want results. Now here you will get your answers. We tested this fan in three buildings. The first time I got hold of this product it was roughly 82 degrees in a small one-person room with poor air conditioning. After playing around with the fan for a bit and running it for about ten minutes, we had positive results. Temperature in the entire room decreased roughly 5-7 degrees Fahrenheit. The room was less stuffy and the temperature was even throughout. This was further tested by opening the adjacent bathroom door (shut originally) which normalized with the temperature of the room that we conducted our test in. We found that angling the fan in a way to let it bounce throughout the room helped, as well as having it push air through an open window. This room is carpeted and the bathroom is tiled. This room was thankfully more comfortable to be in already. The chances in this room a lot more minimal. The entire area dropped 2 degrees Fahrenheit. The wind made it feel more comfortable than that of course. Additionally the fan reached across from the kitchen to the living room without a problem. The air bouncing was felt in the living room (where we conducted the test) but not the kitchen. This area had wood flooring and the connecting kitchen was tile. This apartment had a temperature of 74F but felt a little stuffy and uneven in areas. Using this fan we angled it diagonally and were able to take it down to 73F and take away a lot of the uneven feeling. It did not eliminate all the stuffiness however but it helped. This room is carpeted. This room was very stuffy to begin with. We found that this fan took the temperature down about 2F and eliminated the stuffy feeling. This room was tiled. This room was chosen because the temperature varies so much. Without electronics on this room sits at a cool 65F but with them, we saw spikes as much as 73F. With the electronics off, there was no change. With them on, temperatures averaged around 70F and even felt cold at times. There was no stuffiness in this room so there was no change there. This room is carpeted. This room had the same problem as the one before it. Electronics would spike the temperature at extreme levels. Without electronics we saw a 2F difference and were able to hit 72F. However when we ran the electronics we were only able to take off 1F, thus leaving the room still hot. The slight breeze did help. The fan did offer some minor relief to the room’s high stuffiness. We believe that if we had more time, we may be able to get better results on this room. This room is carpeted. Note: Location #3 (the house) did not have building plans that we could use specifications for and thus estimates were given instead. Most tests did deliver results. The fan did not do well in test two or test six which we thought was unfortunate. However the fan offered some bit of alleviation for all six tests. We were hoping for larger temperature differences even though it was an unrealistic expectation. Only rooms with high ceilings will experience greater temperature differences. One thing is clear; this fan really does need to be played around with to find the most effective results. The fan certainly has enough power at all three settings, but results will vary. Since it is the summer, we have not really been able to test this too much but this fan has been advertised as having year-round uses. 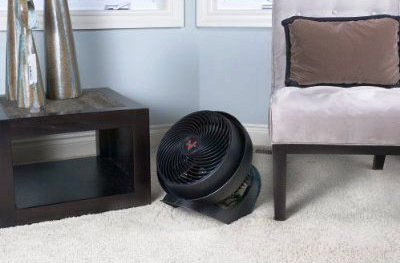 Owners of Vornado fans can put their fans in front of their fireplace, and have it face away from the fire. Doing so will bring the heat out into the room, as the fan will pull in the hot air and push it outwards. While testing it in the location we did test one, we found a two degree difference when pointing the fan out the window. Although we did not use a fireplace, the concept of pumping out heat into another area is the same except we used it for cooling. It is important to note that scientifically this concept will work for other fans as well, but we only accept it helping a couple degrees. We did not conduct any further testing here. Customer service was not only was incredibly responsive and helpful, but they were with me every step of the way. Sending my product for repair was the easiest task I ever have had to do and it was only gone for a week or so. Very satisfied! They covered shipping the product out, and return shipping. All I had to do is package it. The other three are still in perfect condition, so there appears to be nothing to worry about. And even if an event arises, you can count on their customer service to help you out. Although we do not have any equipment to measure how loud the fan is, we still felt that we should comment on it. On low and medium, the fan is not too audible. Medium is a little louder than a computer running. On the highest setting, the fan is loud and it is extremely powerful. Our staff did not find the noise distracting or bothersome; however it is important to note that users have varying opinions on this of course. I just wanted to give a quick praise here. The Vornado has a wonderfully long cord. I was able to access outlets without a problem during all of these tests. Additionally I wanted to reiterate that this product comes in black and in gray. Our models were black. I am not one to get excited about fans but the Vornado caught me by surprise. It looks and feels like a well-made machine. I have taken .75 off because they over-hype the temperatures difference in their advertising. Additionally I believe the product should be a little cheaper, and finally I would like additional handle angles for those “just in case” situations. This entry was posted	on Friday, August 20th, 2010 at 4:40 AM	and is filed under . You can follow any responses to this entry through the RSS 2.0 feed. You can leave a response, or trackback from your own site. Great review on the Vornado 733. Definitely a cool item. Do you have the dimensions of the packaging? Hi Zenith58. The product dimensions are 15.2 x 16.2 x 14.2 inches. The box itself only has a few inches of padding each way so it would be closer to 17.2 x 18.2 x 16.2 inches. I can get you the actual dimensions if you really need them. Sorry for the late response.